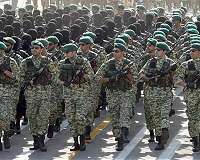 Turkey on Tuesday condemned the US move to designate Iran’s elite Revolutionary Guards a “terrorist group”, saying the decision would create “instability” in the region. Washington’s move against the Revolutionary Guards was the first time that the United States has branded part of a foreign government a terrorist group. “These kinds of decisions will pave the way for instability in our region,” Turkish Foreign Minister Mevlut Cavusoglu told reporters in Ankara. The decision against the “official army of Iran… was incomprehensible,” he said. He also criticised previous “one-sided” American sanctions against Iran and “pressure” on other countries by Washington to adhere to them. Turkey and Iran have been working to develop pragmatic relations with each other, particularly over the Syria conflict despite being on opposing sides. Tehran supports the regime of Syrian President Bashar al-Assad while Ankara has repeatedly called for his ousting and has provided assistance to opposition fighters. Cavusoglu added Turkey had itself opposed the Revolutionary Guards’ actions in Syria. There have been growing tensions with the US and Turkey over multiple issues including American support to a Syrian Kurdish militia viewed as terrorists by Ankara but whom Washington relied on to spearhead the fight against the Islamic State group in Syria. Now the NATO allies are facing further strains and Turkey itself risks US sanctions over the push to buy Russian S-400 anti-aircraft missile systems. Baghdad tried to stop Washington from blacklisting Iran’s Revolutionary Guards as a “terrorist organisation,” Iraqi Prime Minister Adel Abdel Mahdi said Tuesday, warning that the decision could further destabilise the region.